What is Windows 7 Credential Manager? Windows Credential Manager is an enhanced Windows 7 tool that enables users to store credentials. Those credentials that Windows users can store using Windows 7 Credential Manager are user names and passwords used to log in to a website, or Windows credentials to log on to other computers in network, etc. Credentials are stored in special folders called vaults on your Windows 7 PC. When you enable Windows 7 Credential Manager store your credentials for a website, Windows can log in to target website for you using stored credentials automatically when you visit to that website. Windows users does not have to memorize username and password or use third-party password management applications to log on websites, or network computers by using the Windows Credential Manager. Credential Manager is a Single Sign-On (SSO) solution developed by Microsoft and is being used since Windows Server 2003 (including Windows Vista). Now we can save credentials in a vault step by step as a demonstration in this Windows 7 guide. Windows Credential Manager which is one of new Windows 7 tools can be used to save credentials in a Windows vault, manage by edit, backup credentials using password protected backup files and restore credential using previous credential backup files. 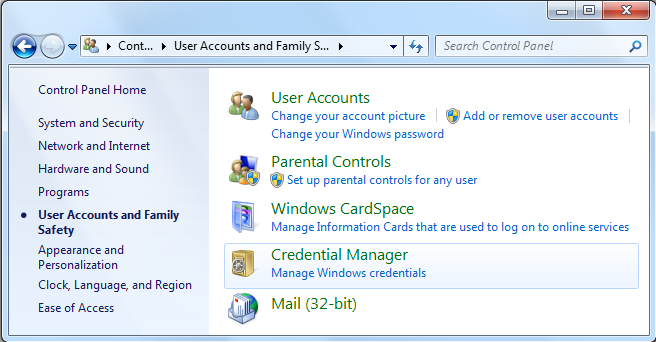 Windows users can open the Windows 7 Credential Manager from the below Control Panel screen. Or copy and paste the below path in a Windows explorer address bar. One last option is to start Credential Manager directly from Windows 7 Start Menu. Windows users can access to the application typing vault, cred, or credential manager in search box and pressing Enter. 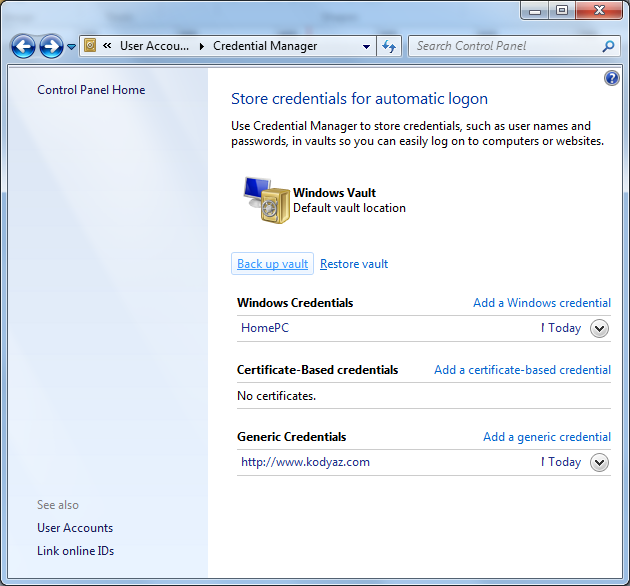 As you can see, there are 3 basic credential types that Windows users can manage using Windows 7 Credential Manager. Windows Credentials can be used to store username or user ID and passwords for network addresses like network computers, network shares, etc. in an intranet. Using the Windows credentials stored in Windows Vault by Windows 7 Credential Manager, users can connect to an other computer in the office network, etc. Certificate-Based Credentials enables users to store digitally signed key certificates, Smart Card certificates, etc. Generic Credentials enables Windows 7 users store web addresses and related username - password information required for a valid authentication. Let's start by adding a new generic credential for a web site. Click on Add a generic credential link buton. Click OK buton to add the username and password for the related website, internet or network address. A Windows credential can be easily added just as a generic credential. First click Add a Windows credential link buton. Then fill the related input areas to define a Windows credential. Press OK buton. Certificate-based credentials are also added to Windows Vault in a similar way. It is a best practise to backup your credentials time to time in order to prevent your data against a damage. On the Credential Manager screen, click on Back up vault link which will activate the backup process for Windows Vault. The backup vault dialog screen will request a back up folder from Windows user. Click Browse... to define a backup folder and file name. The backup file has the .crd file extension. After the back up file name and the folder is defined the Next buton will be active. Click Next to proceed to following screen. Then you will be asked to supply a password in order to protect the backup with a password. You will be asked to enter the password twice as a standart method. When you define a password for the Windows credential backup file, Credential Manager will take the back up of the existing credentials and display that the backup is succesfully created. Using the same Windows Credential Manager screen, but this time with the help of Restore vault link buton, users can restore Windows 7 credential from a previous backup file. Press CTRL + ALT + DELETE to continue restoring your logon credentials on the Secure Desktop. Then you will be asked to enter the password defined to protect the Windows credentials back up file. When you enter the correct password, you will be informed that the Windows logon credentials are restored successfully.